In my review for the now-forgotten Beirut from a few months back, I had mentioned how co-star Rosamund Pike possessed a “sturdy” and “persevering demeanor” consistent from project to project. For the past decade, Ms. Pike has come off as a dedicated character actress seeking to become the much-demanded leading lady. Unless a role or the movie around her is as ambitious as she is, her presence ends up doing little to elevate the overall work. She earned her Best Actress Oscar nomination for 2014’s Gone Girl because the film and the role of “Amazing” Amy Dunne oozed with intrigue, thanks in large part to David Fincher’s direction and Gillian Flynn’s screenplay. With A Private War and the demanding role of slain journalist Marie Colvin, Ms. Pike succeeds in returning to such captivating acting heights, even when interest for the movie around her pales in comparison. Based on Marie Brenner’s 2012 Vanity Fair article “Marie Colvin’s Private War”, the film A Private War follows Marie Colvin, who worked as a foreign affairs correspondent for the British-based Sunday Times from 1985 until her death on February 22, 2012, while she was covering the siege of Homs, Syria. That event closes A Private War, whereas her early 2001 assignment in Sri Lanka opens the story. It was during that episode that an RPG explosion caused the loss of sight in her left eye, after which she donned her recognizable eyepatch. In between lay Colvin’s alcoholism and cigarette addictions, her frustrated search for a soulmate after miscarriages led to the failure of her first marriage, and the ravages of war immortalized by her writing. 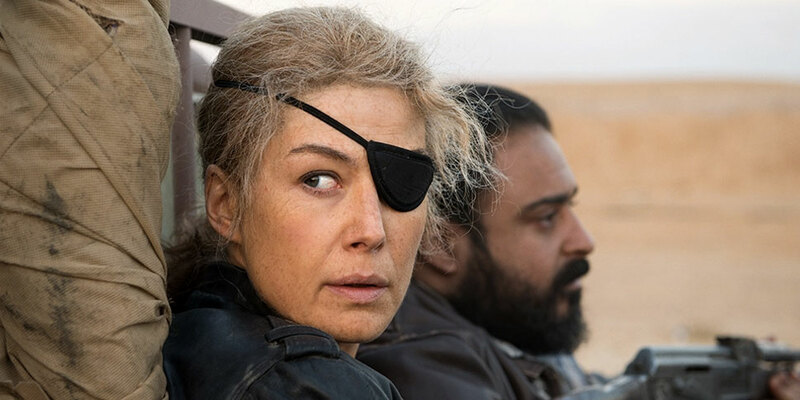 A Private War’s fusion of war docudrama and biographical study succeeds thanks to Rosamund Pike’s piercing star turn as Marie Colvin. Pike shows astounding dedication in conveying Colvin’s death-defying perseverance as well as her dark sense of humor. Whereas Pike’s talents this year felt underused in Beirut and out of place in 7 Days in Entebbe, she and A Private War’s ambitions match firmly well. Of her three male co-stars, Tom Hollander leaves a fair impression as Sunday Times foreign editor Sean Ryan. Hollander wrestles between sending his reporters to danger zones to report for him, garnering him industry accolades as a result, and working to protect them from psychological dangers. In one of A Private War’s standout scenes, a concerned Hollander admires Pike for putting to ink the images their readers cannot imagine while also charging her for failing to imagine a world where she does not have to do so. I cannot express similar praise for fellow male supporting actors Stanley Tucci and Jamie Dornan. As Tony Shaw, Tucci gives a rather thankless turn as Pike’s new love interest and potential soulmate—a trope that disappoints regardless of gender. Dornan, meanwhile, cannot seem to justify the inclusion of freelance photographer Paul Conroy beyond the fact that Conroy was at Homs with Colvin during her final moments. Writer Arash Amel, whose Grace of Monaco project fared poorly four years ago, would have done better to minimize Tucci and Dornan’s roles and provide more room for director Matthew Heineman’s spectacular war sequences. Heineman has only directed documentaries before (including the Oscar-nominated Cartel Land and last year’s City of Ghosts) and it shows at times in A Private War’s quieter moments. Not so for the battle scenes, where the collaboration between Heineman, film editor Nick Fenton, Gareth John and Andrew Stirk’s sound team, and production designer Sophie Becher (among many others) result in some of the most thrilling and realistic wartime action in recent years. In an age where science fiction and fantasy-based action reign at the box office, A Private War serves to remind audiences that such is not all fun and games in the real world. War is one lethal drug, not just for hardened combatants, but also for those extraordinarily literate civilians willing to record humanity’s worst traits for posterity’s sake. Thanks to the talents of director Matthew Heineman and actress Rosamund Pike, history will remember that Marie Colvin of The Sunday Times was one such figure.